It is no secret that wide receiver was the one position that alluded Ozzie Newsome for decades. The Baltimore Ravens always made great picks in the NFL Draft, but the team never found wide receivers the same way. Most receivers picked by Newsome amounted to little in the NFL (with the clear exception of Torrey Smith, a second-round pick in 2011). Baltimore’s most recent high round receiver selection, Breshad Perriman, became one of the most infamous busts in Ravens history. But now that the much-lauded days of Ozzie Newsome are behind us, Eric DeCosta will attempt to do what Newsome never could. DeCosta will try to successfully draft a number one wide receiver. The next generation of Ravens wide receiver may just be N’Keal Harry of Arizona State, the player I believe may be the safest pick of the draft class. Ask a scout to draw up a wide receiver. The result will probably resemble N’Keal Harry. At 6’2″ tall and 228 lbs heavy, Harry has great size to weight ratio. His height allows him to tower over smaller defenders, and his weight to resist hits and push through tackles. Each of these two body statistics is paired up with a performance one. Harry’s height is complemented by his vertical leap ability. Not only did he show up to the combine with an impressive 38.5″ vertical jump, but the game film confirms that he can use this ability in game. His weight is paired with his incredible strength. Harry totaled 27 bench press reps of 225 lbs at the combine. This can also be seen on the field. Harry bullies weaker and smaller defensive backs. He uses his body weight to his advantage and puts himself in a great position to win the ball. Not only that but after catching the ball, he often (successfully) fights for extra yards. N’Keal Harry fights for every opportunity on the field. Whether it is in the battle for crucial second chance yards, or a scramble for an ill-placed football, Harry is going to make the same effort on every play. He consistently pushes himself to win matchups. His effort yields him the best hands of any wide receiver prospect in the draft class. Harry catches almost every ball that comes to him. This leads to some amazing catches that only receivers of an elite caliber can pull off. The only passes he sometimes fails to grab are highly contested ones. Furthermore, he is not only giving his best effort when he is the center of attention. Unlike many receivers, Harry is willing and wanting to block. He aggressively blocks defenders and often prevents them from getting anywhere near the ball carrier. It is also worth noting that N’Keal Harry possesses a full route tree. Unlike a raw athletic talent like D.K. Metcalf, Harry is a refined pass catcher with an eye toward strategy, not just brute force. While all these qualities are great to have for any wide receiver, what really sets N’Keal Harry apart from the rest of the draft class is his durability and long term production with the Sun Devils. Harry played for Arizona State for three seasons. He totaled for 659 yards as a freshman, 1142 as a sophomore, and 1088 as a junior. The workload he endured was one that most college receivers either dream of or dread, because while Harry gained recognition as a fantastic receiver, he also took a beating. Remarkably, the extra contact had very little effect on him. N’Keal Harry missed just one game in his three years at Arizona State. In short, N’Keal Harry is a big, tall, and strong pass catcher that consistently produced for three years straight. Harry is magical on the field. He makes impossible catches look easy. He creates mismatches in the secondary that will be very difficult to cover up at the NFL level. He is unmistakably the best wide receiver in this draft class. While I believe that Harry is the best receiver in this class, he is not without his flaws. The most obvious is his speed. N’Keal Harry ran a 4.53-second 40-yard dash at the NFL Combine but appears to play slower in game. As a result, he lacks a quick jump off the line of scrimmage. Harry sometimes seems lost in the red zone too. He works his best in open areas, and Arizona State did not always rely on him to make catches in the end-zone. I highly suggest you watch the video version of this prospect review. I can go on and on about how great I think N’Keal Harry is, but without watching the tape, without seeing him play, it is impossible for you to conceive of his ability. N’Keal Harry shattered my expectations of him. Before watching the tape, I knew that he was being graded as a first-round receiver, but I did not expect to come away thinking he was far better than the rest. Harry’s measurables are solid, but his abilities are extravagant. Whatever team that picks him will be getting a solid number one wide receiver for years to come. Grade: 8.6/10.0 – Early first round pick. 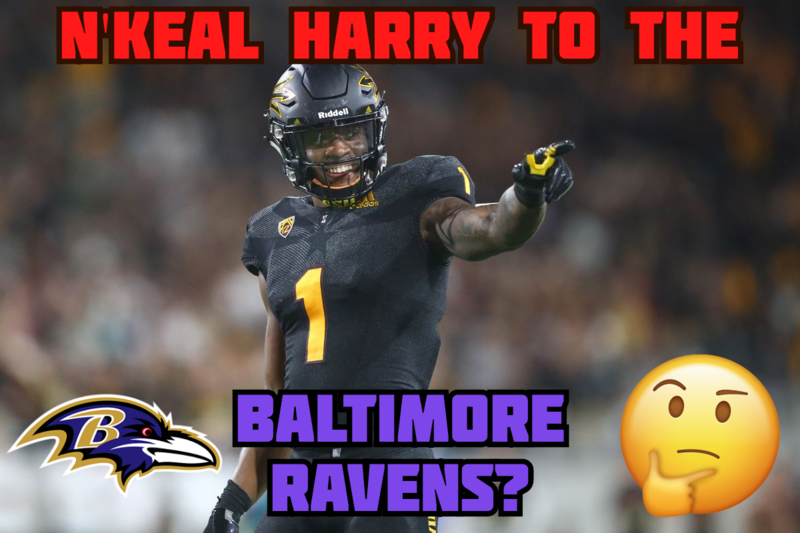 Should the Ravens Draft N’Keal Harry? Absolutely. I would be ecstatic if the Ravens pick N’Keal Harry with the 22nd pick. Although I graded him as an early first round pick, the current consensus is that Harry will go in the latter half of the first round. If the Baltimore Ravens have the chance to select Harry at 22, the team must do it. Eric DeCosta can start his tenure off as general manager right by selecting a sure-fire successful wide receiver for years to come. It would give Lamar Jackson a target he can trust, and Ravens fans the relief that the team finally succeeded at picking a wide receiver. It would be insane to pass on Harry if he is available by the time the Ravens are on the clock. If Baltimore passes on him, fans will always think about what could have been, just like last year when the Ravens passed on safety, Derwin James and wide receiver, Calvin Ridley.